Pongal is the tradition food of south india. We have taken care in choosing the ingrdients for our multigrain pongal. In special, rice is replaced with multiple grains in a balanced proportion to suit the taste. Start the day with a healthy breakfast ! Step 1: For 1 measure of Ammae Multigrain pongal, add 3 measures of water and stir without lumps. Step 2: Pressure cook for 5 whistles after removing add required ghee, curry leaves and roasted cashew for taste. Fresh vegetable like capsicum, carrot, potato and other can be cooked along with mixture to get delicious kichadi. Salt and pepper should be added according to taste. Note: Avoid hot or cold water for initial mixing to avoid lumps. Multigrain Pongal Traditional food with multiple grains, without rice Ingredients : Wheat Rava, Green Gram Dal, Little Millet, Oats , Black Pepper, Cumin seeds, Asafoetida & Salt Pongal is the tradition food of south india. 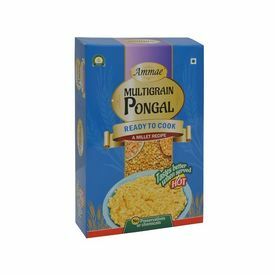 We have taken care in choosing the ingrdients for our multigrain pongal. In special, rice is replaced with multiple grains in a balanced proportion to suit the taste. Start the day with a healthy breakfast ! Multigrain Pongal, Simple preparation Prepartion time - 20 min Step 1: For 1 measure of Ammae Multigrain pongal, add 3 measures of water and stir without lumps. Step 2: Pressure cook for 5 whistles after removing add required ghee, curry leaves and roasted cashew for taste. Fresh vegetable like capsicum, carrot, potato and other can be cooked along with mixture to get delicious kichadi. Salt and pepper should be added according to taste. Note: Avoid hot or cold water for initial mixing to avoid lumps.